If you are taking your car to Manchester Airport then obviously you will need parking. However, if you are like many people who drive to the airport on the day of their departure, you will always have the fear of being late for your flight niggling on your mind. The motorway networks around Manchester Airport can certainly be very busy and very unpredictable (especially in rush hour). All it takes is one hold on the M56, M6, M60 or M62 and you are watching your clock and becoming more anxious as every minute goes by. If you are one of these people who stress out at the thought of driving to the airport on the day of your departure, have you ever considered booking airport parking with a hotel? Booking airport parking and being able to stay at one of the hotels at Manchester Airport or close by, is definitely the perfect way to stay your holiday or business trip and it does not cost much more money to do so! Manchester International Airport is one of the busiest airports in the UK and as a result has a large number of top class hotels close by. The majority of these hotels close to Manchester Airport all offer Stay and Park packages (especially the larger hotel chains), which means you can stay for a night at the hotel and park your car for the duration of your trip. 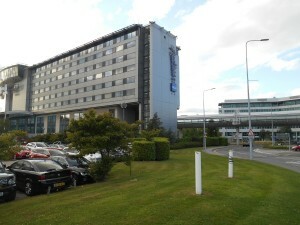 Although the majority of the hotels near Manchester Airport offer hotel rooms and free parking packages, each one operates different policies and procedures and it is advisable to check the hotels procedures and policy before you book with them, just to make sure they will suit your requirements and needs. Depending on which hotel you book your hotel and parking package with, will determine how you will be required to park your car. Some hotels provide you with your own parking space onsite at the hotel. If this is the case, all you will need to do is simply drive to the hotel and then park your car or have a member of staff at the hotel park it for you. Then, on the day of your departure, you will be transferred from the hotel to the airport either by private shuttle bus or a taxi. When you arrive back in Manchester on your return flight, you will be picked up at the airport and then taking back to the hotel to collect your car. Another of the procedures is that you arrive at the hotel and park at the hotel overnight and then you drive to one of the Manchester Airport parking facilities, where you will leave your car for the duration of trip. If this is the case, you will then park in one of the parking bays at the car park and then catch one of the free shuttle buses that run every few minutes throughout the day and night and transfer passengers to and from the airport. On your arrival back in Manchester, you then simply catch the same free shuttle bus back to the airport parking and collect your car. Hotels that are actually located onsite at Manchester airport such as The Radisson Blu Hotel, offer hotel and parking packages and provide onsite parking for their guests. This means that all you need to do on the day of your departure is simply walk from the hotel directly into the airport terminal via one of the covered walkways. The majority of packages for Manchester Airport Parking and Hotels usually include free transfers. However, with some packages you may be required to pay an extra fee for your transfer! When you do a search online for a Manchester airport hotel and parking, you will see a large number of different packages that are available from a number of different hotels. All these packages vary and this is why it is always best to check what your package includes before you actually make your booking. Once again, each hotel offers a selection of packages which all vary in price and what they include. Packages range from the basic standard hotel room with parking, through to VIP Meet and Greet parking at Manchester Airport. Some packages include evening meal, breakfast and other facilities at the hotels such as spa treatments. There are three terminals at Manchester Airport so it is always advisable to ensure you know which terminal you will be flying from. Although it is relatively easy to connect to all three terminals from each other, if you are wanting to book a hotel that is actually onsite at the airport and wish to park your car, it is much better if you choose a hotel to stay at, that is actually located in the terminal to which you are flying from. Some airport packages will cover all three terminals whilst others only cover specific terminals. When you do a search for hotels at Manchester airport that offer free parking, you will generally be offered a number of choices of hotel for each of the 3 terminals. There are several factors that determine the price of a Manchester Airport parking and hotel package at any one time. Obviously, supply and demand plays a very big part in how much the price for a hotel room with parking will be at the time of your travel. At peak times, you can expect to pay a higher price as the demand for hotel rooms at Manchester Airport will be high as opposed to quieter periods. The location of a hotel will also be a major factor in how much the price will be and if the hotel is located in the terminal building or very close to Manchester Airport, you should expect to pay a much higher price than you would for a hotel a couple of miles from the airport. Star Rating is another factor that determines the prices of a hotels at Manchester Airport. Some of the larger 4 star hotels that are located at the airport charge a much higher price that the lower 2 and 3 star hotels near Manchester Airport. However, you must always remember, that a star rating of a hotel is only given on the facilities that the hotel provides and not its cleanliness. This means that if you are only looking for a hotel room for the night at Manchester Airport and are not too bothered about all the added luxuries and facilities, then you may be better considering one of the lower star rated hotels and save a little money in the process. The easiest ways to find the best deals on airport parking with a hotel at Manchester Airport is simply by using one of the hotel and parking comparison websites. There are now several companies that offer search facilities and if you want to save yourself a lot of time and effort, the following companies generally offer competitive prices on Manchester Airport parking and hotel packages.